This entry was posted in Movies and tagged Baz Luhrmann, Carey Mulligan, F. Scott Fitzgerald, Gatsby, Great Gatsby, Jay Gatsby, Joel Edgerton, Leonardo DiCaprio, movie reviews, movies, Nick, Tobey Maguire, United States. Bookmark the permalink. I still don’t know if I want to go to the theater to see this. 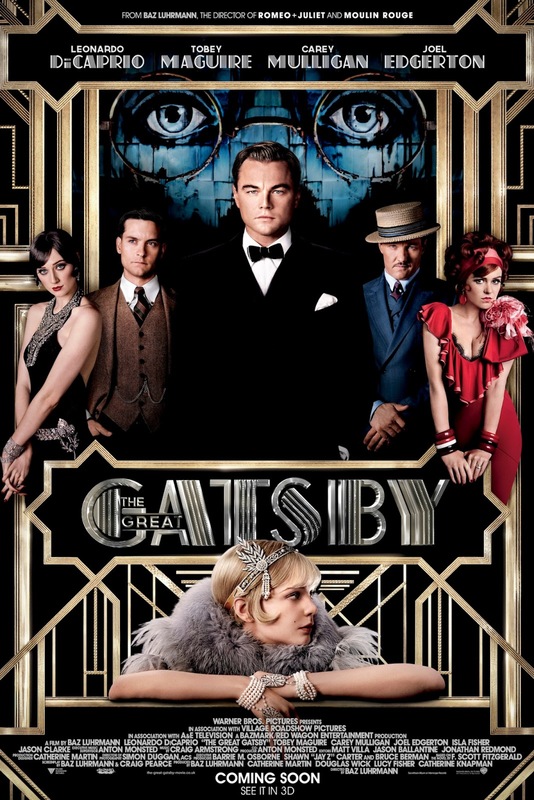 I hated the book, but I think DiCaprio is the perfect choice for Gatsby. Great review. I’m a huge Fitzgerald fan, This Side of Paradise and The Curious Case of Benjamin Button are two of my favorite stories. I don’t know why I hated Gatsby so much. If I’m bored today or tomorrow, I might go see it. Hmmmm… I wonder what it was that rubbed you up wrong then. I would love to read a review with your opinion on it, so here’s hoping you get bored! Nice review! Glad you enjoyed it! I liked it a good deal as well. Very strong performances and I loved its faithfulness to the book. Great point about Maguire. I’m not a big fan of his but he was really good here! Just a good overall movie, not perfect, but very entertaining. Thanks Keith! It was so worth seeing on the big screen, I thoroughly enjoyed it. Definitely not perfect, but I don’t think it deserves the extreme knocks it is getting! Fabulous review girl! I think I’d agree w/ you about the rating. I too went in w/ tepid (well maybe neutral) expectations and it turned out a bit better than I thought, even if it’s not as emotionally gratifying. I like how Baz made DiCaprio’s Gatsby such an enigmatic person, just the way the built up until Nick met him is fun to watch. I agree w/ a lot of your points. Yes visually it impressed me, the production values are just superb & yes, I thoroughly enjoyed it in 3D. I’m not a huge Tobey fan either but I thought he was perfect as Nick and the friendship (if you want to call it that) between him and Gatsby is more heart-wrenching than the romance to me. Having seen the 1974 version (well barely, as I couldn’t finish it), I think this version captured the ‘essence’ of the story, all that glamor that amounts to nothingness. I was very impressed, and so glad that I went. I had more surprises than let downs, and that is saying something seeing as the reviews really were all over the board with this one. I heard that the 1974 one is just too dated. I wonder if I should try it out anyway? Ah, you hit the nail on the head right there! Good review Zoe. No doubt that it’s not a pretty-looking movie, but just something was missing in terms of the emotional-department. Thank you, Dan! Visually stunning, yes, but the emotions were not as hollow as I thought they would be. They were not so captivating as one would expect, but they were there (just possibly not as solidly as they should have been). Although hate would be a strong word I wasn’t a fan of this. All the CGI was annoying and I could never get into it. Ah, that is a pity! I had to Google that now, but just WOW! I would love to watch films in a cinema like that! I want one! Ah so amazing! You better win a lottery then! I shall start the saving! Thanks Tom! I would love to hear what you think of this after a rewatch. That soundtrack was absolutely awful, which is a pity because everything else was done so incredibly well. Ugh. I quite liked it too and I quite hated some of the music as well. Like you said, critics may have disliked it but I was onboard the whole way through. 🙂 I recall you quite enjoyed it! Well, the critics certainly don’t know everything. the shirt scene in the Robert Redford version is awful! Is it? I have never actually seen the Redford one! I don’t like the Redford version – he is woefully miscast. I don’t like they’re interpretation of Daisy, either. it lacks energy… they forgot the “roaring” in Roaring 20s!